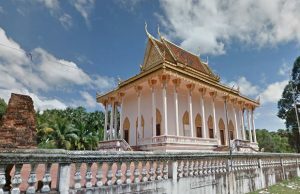 Wat Vihear Kuk, Kratie is one of the popular sightseeing destinations in the colorful Cambodian town. Kratie is the capital of the province of the same name. You will find here picturesque landscapes and ancient structures worth visiting. Kratie being relatively remote and less touristy, you will have a quiet and relaxing vacation here. The town of Kratie is located by the Mekong River. A group of rare Irrawaddy Dolphins are found in this stretch of river. 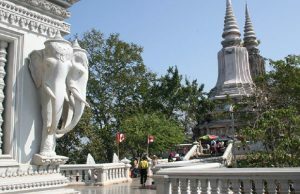 You can spend some refreshing time here visiting the fascinating tourist attractions in Kratie. Make it a point to include the Wat Vihear Kuk, Kratie in your itinerary for a memorable experience. 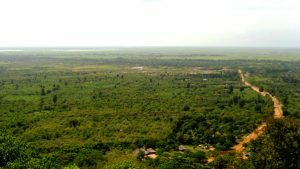 Wat Vihear Kuk in Kratie is located 36 kilometers from the provincial town. It will take you approximately an hour and half to travel to this place. Wat Vihear Kuk is included among the historical sites and buildings of the town. The structure is located at Sambor Village in the district of the same name. Here, close to the building, you will find the famous 100 Column Pagoda. East of the 100 Column Pagoda you will find a narrow track leading to a smaller pagoda. 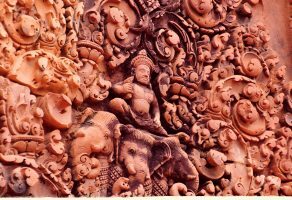 This is the Wat Vihear Kuk, Kratie. You can ask the young monks nearby of the history of the structure to know of the background of the structure and the place. The grimy and ruined structure has been here for ages. It makes for a good sightseeing destination. There are present inside the building many roughly drawn paintings.